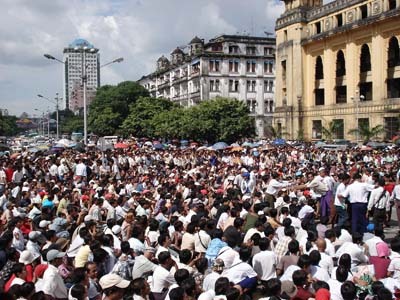 The Associated Press announced today that AP Archive has reached an agreement with Democratic Voice of Burma (DVB), an independent, nonprofit Burmese media organization, to license DVB’s video coverage to third parties around the world. With this agreement, AP Archive is the only international news agency with the rights to sell DVB’s archival video footage of Burma from the past five years. This representation agreement is of particular importance because Burma is preparing to hold general elections in November for the first time in 20 years and the footage includes coverage of recent anti-government uprisings. The content partnership with DVB is the latest in a growing number of significant partnerships with broadcast and media organizations that AP Archive now represents, including ABC News, Chinese Central Television, Vatican Television and WWF, the conservation organization. AP Archive holds a large and growing amount of footage created by DVB and will add to the collection with more footage from DVB’s television archives. The archival footage includes anti-government protests, widespread damage caused by cyclone Nargis and its aftermath, and the continued detention of pro-democracy leader Aung San Suu Kyi. “AP Archive is well regarded within the footage industry and we are happy to be partnering with them. This agreement will allow us to concentrate on our core television operations, whilst knowing that our footage is available for producers to access and use,” Aye Chan Naing, chief editor of DVB, said. The Associated Press is the essential global news network, delivering fast, unbiased news from every corner of the world to all media platforms and formats. Founded in 1846, AP today is the largest and most trusted source of independent news and information. On any given day, more than half the world's population sees news from AP. Democratic Voice of Burma is a non-profit media organization based in Oslo, Norway, run by Burmese journalists from both inside and outside the country. DVB has been broadcasting uncensored daily television news since 2005, providing footage that is not otherwise available to people inside the country as well as international news media organizations.